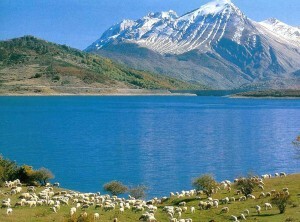 With its surface of 14 square km, Campotosto lake is the biggest man-made lake in Abruzzo region. 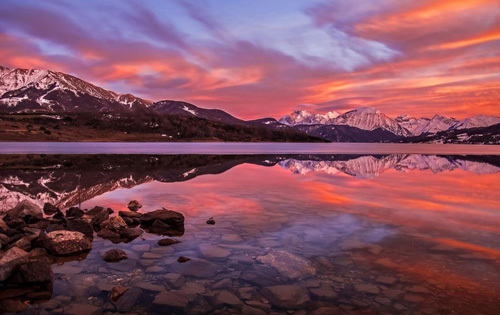 It is located in L’Aquila province in the national park “Gran Sasso e Monti della Laga” at 1313m above sea level. 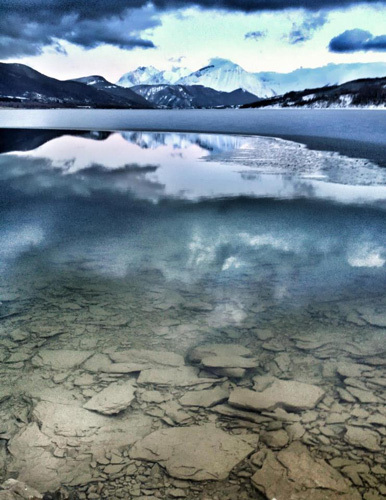 The history of this lake is very hancient and fascinating: During the formation of the glacier in the Quaternary Period, the Campotosto Lake was a water basin shaped as a double “Y”. Nowadays, the upper portion of the artificial lake maintains the double “Y” shape, but the lower side is shaped more like “V”. 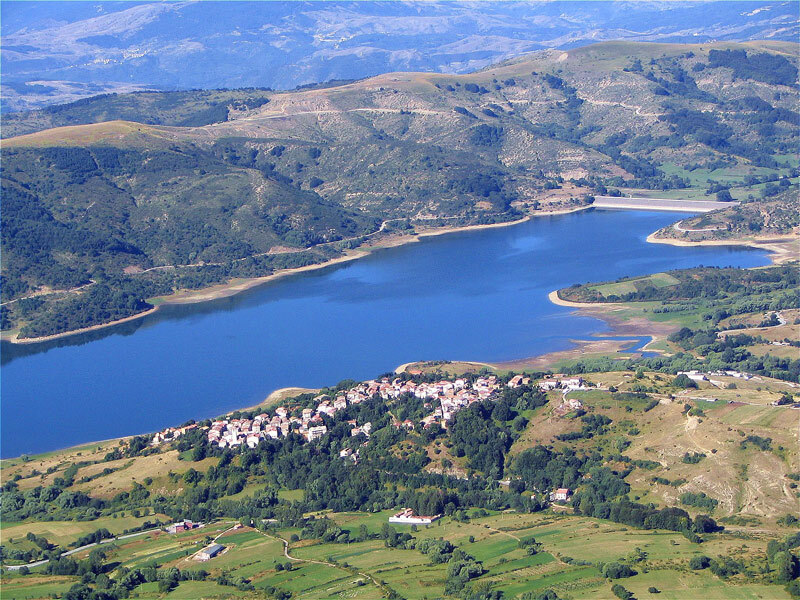 During the 30s and the 40s the entire valley has been filled with water by means of constructing three dikes, Lake Campotosto was created in this way. 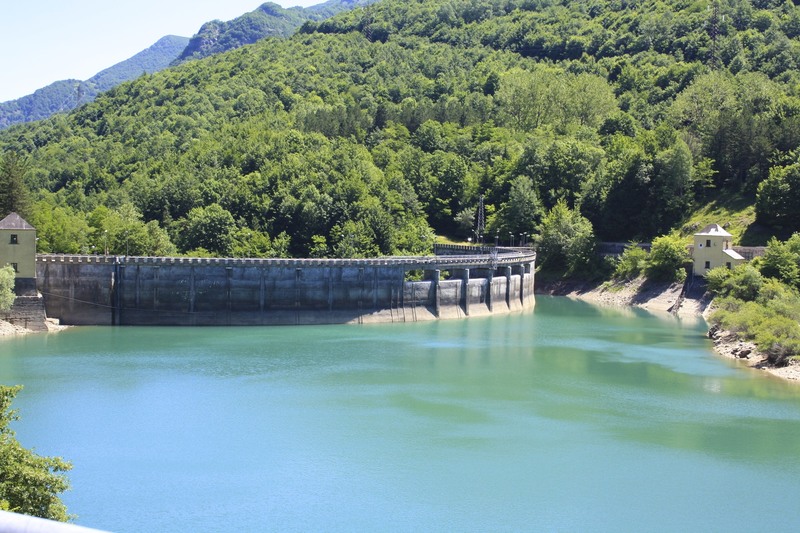 The main reason for creating the lake was to establish a water reservoir that could be used to generate hydroelectric power in the Vomano valley. During the construction of Lake Campotosto, a cableway leading to the Capitignano railway station was fortified. It was used to transport building materials and to carry earth away from the excavations. From Capitignano the rail line headed to L’Aquila following a course that had earlier been used for the transportation of peat. The rail line was abandoned soon after construction of the lake was completed. During the winter the lake freezes completely over while in the fall many people come for a visit to admire the colourful foliage in the nearby forests. The walk along the lake measures 40km, and there is also a cycling path all around the perimeter of the lake. 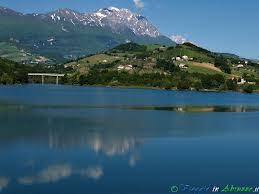 Scanno lake is famous for its beautiful heart shape and is the biggest natural lake in Abruzzo. It is located at 930m above the sea level surrounded by woods and forests. 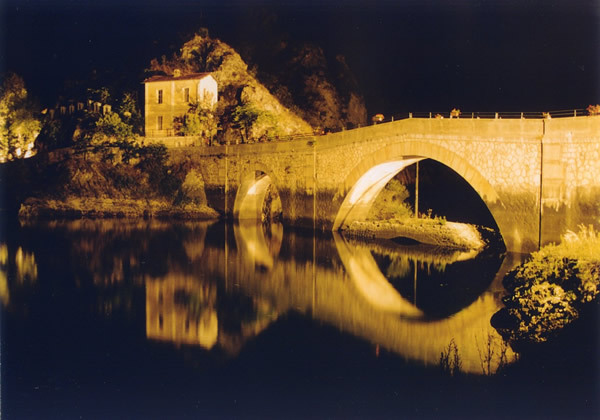 The basin was created by a landslide precipitated from the Monte Rava that obstructed the river Tasso. For long time it was thought that the landslide had been caused by the earthquake occurred during the 217 a.C. mentioned by Tito Livio, however more recent studies have proved that the landslide took place during the post-glacial period. The exact point where the landslide occurred is called Frattura (fracture) and here are still present the ruins of the ancient hamlet Frattura Vecchia, now almost completely abandoned. The lake is alimented by the river Sagittario, but apparently it does not seem to have emissaries because the river runs underneath the soil for the tract closer to the lake. 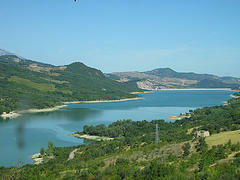 The coasts of the lake are very small, especially between Montagna Grande and Monte Genzana. The fauna is composed by hawks, wild ducks, owls, goshawks, eagles, and other wild birds. The waters of the lake are inhabited by trout and rock basses. 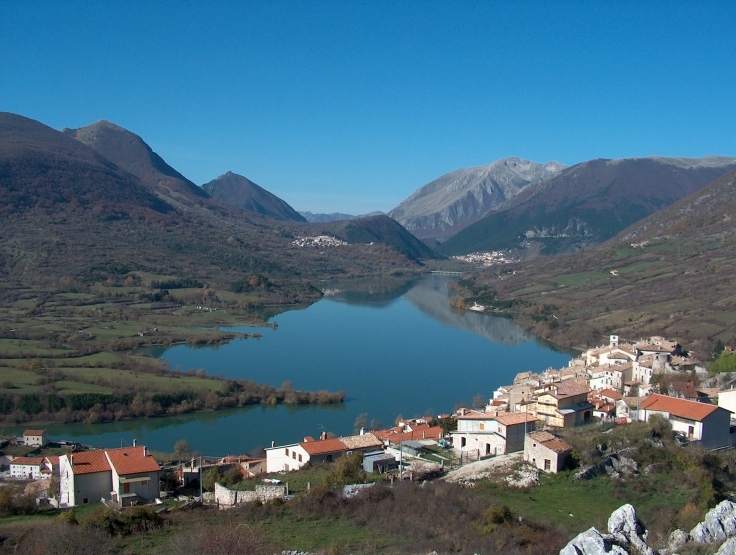 The Barrea lake is artificial and is located in the Abruzzo National Park, between the mountain community of Alto Sangro and in the plateau called Cinquemiglia. 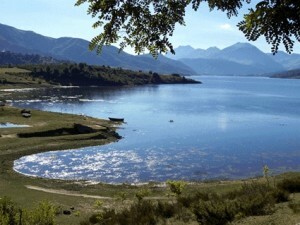 The lake was created in the 1951 by the obstruction of the river Sangro on the Barrea mouth. Perched on a spur in the middle of the Sagittario Valley, one of the most beautiful areas in L’Aquila province, it is a tourist resort for summer and winter sports; tourists are offered leisure facilities, natural beauties and art, folklore, handicraft (goldsmith’s and pillow lace’s art).The blocking up of the river Tasso because of a landslip that slid down Mount Genzana originated the lake, fed by the above-mentioned river.You can enjoy the lake especially in summer.In the several small but well-equipped beaches you can go for a swim, hire pedalos, windsurfs, canoes, deckchairs and sunshades. 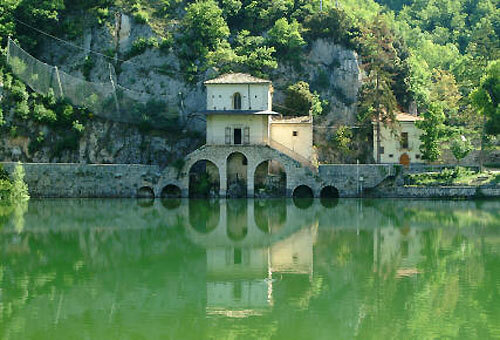 The lake is surrounded by several small and lovely hamlets: Barrea, Civitella Alfedena, Villetta Barrea. Sinizzo lake is located at a short distance from the enchanting hamlet of San Demetrio ne’ Vestini; It’s mirror-like surface waters are alimented by two natural spring waters called Aquatina and Sinizzo, the waters are so clear and unpolluted that bathing is a allowed and very pleasant. 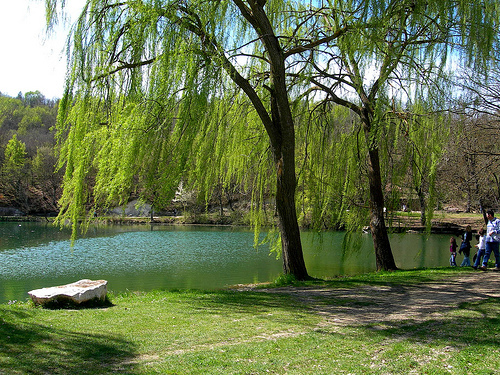 The surrounding landscape is marvellous, the coasts of the lake are shaded by luxuriant willow trees. Not far from the lake are located the caves of Stiffe, open for visits all year around, the caves are characterised by stalactites, stalagmites and waterfalls. Especially in spring time the waterfalls and the subterranean river create suggestive sceneries and water effects. 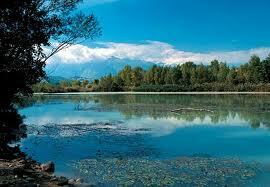 This lake is an artificial basin located at the confluence of Vomano river and Chiarino stream. 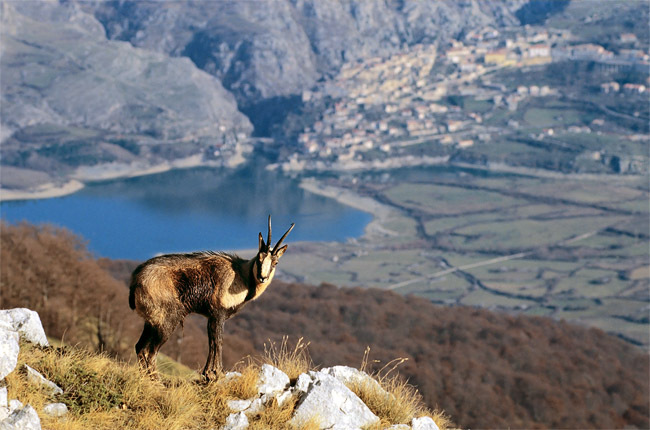 It represents the mouth point of Chiarino valley, an enchanting natural reserve perfect for walks. 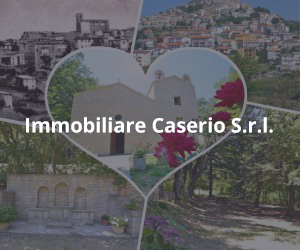 The best walk starts from the small church of San Martino, up to Piano del Castrato walking all along the Prese dell’Acquedotto del Chiarino. Piano del Castrato is right opposite to the ridge of Monte Corvo. Further head there is a mountain hut called Rifugio Fioretti, close to Vaccareccia farm where the walk ends. 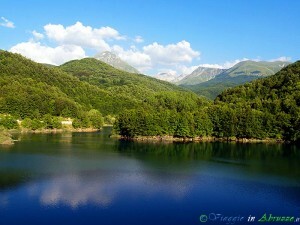 This lake is located in Sirente – Velino regional park, in the valley of Prati del Sirente. It has a circular shape and small dimensions, its diameter is 140m. 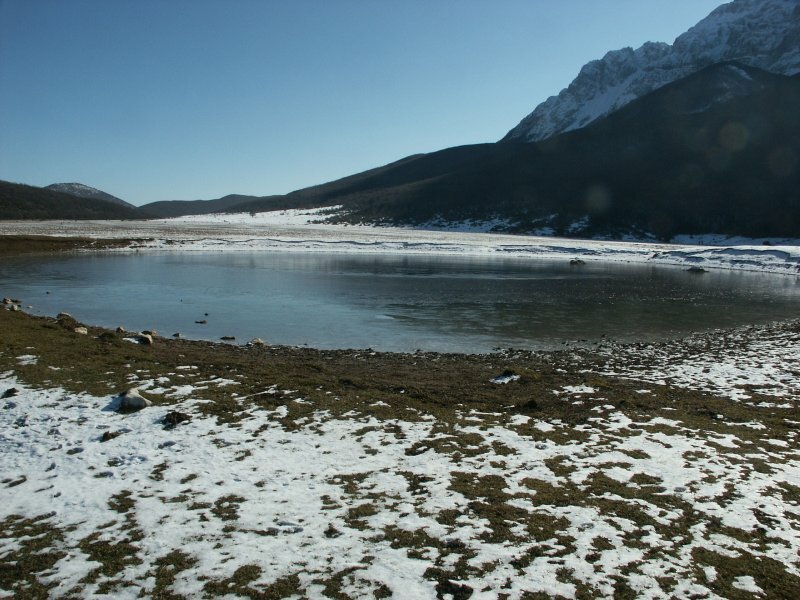 Lake Sirente has glacial origins and stands on not rocky sediments. After years of researches, geologists have hypothesised that this lake is the first meteor crater recognised in Italy. It’s a fascinating theory, that has not yet been confirmed. 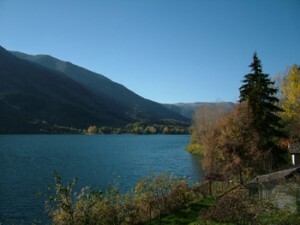 This lake is located on the road that connects Anversa degli Abruzzi with Scanno, in the proximity of an hamlet called Villalago. 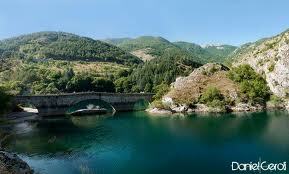 The lake is right below the overhanging rocks and close to it there is an hermitage called with the same name. 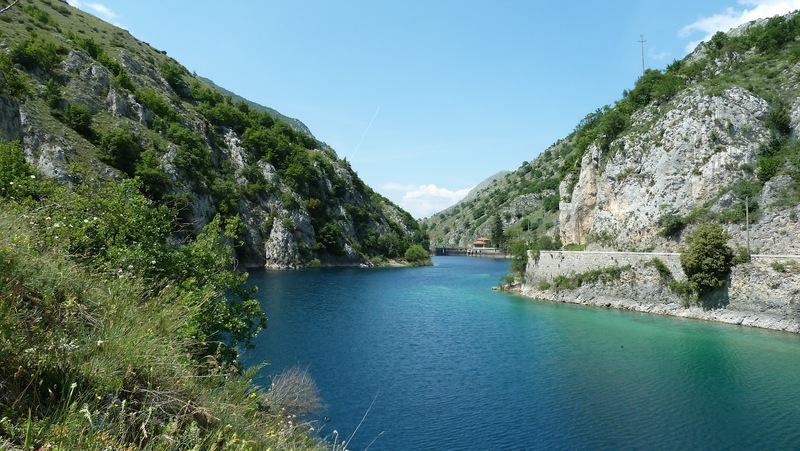 It is an artificial basin created by a dam on the Sagittario river, with the purpose of producing electric energy. 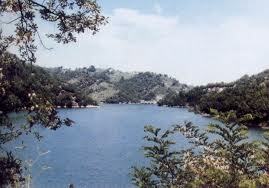 The lake is also feed by little affluent like the waterfall Sorgente Sega and the stream Prato Cardoso. The area surrounding the lake is populated by various types of birds, fishes and wild animals like foxes, squirrels, dormouse and also bears and wolves. 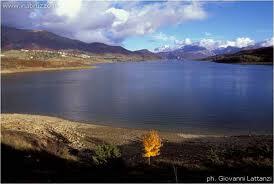 The coasts of the lake are flat and easily accessible, there is also a beach but bathing and fishing are forbidden. Campo Imperatore is a huge and suggestive plateau located behind the Gran Sasso mountains, it’s an evocative place that has been called “Little Tibet”. 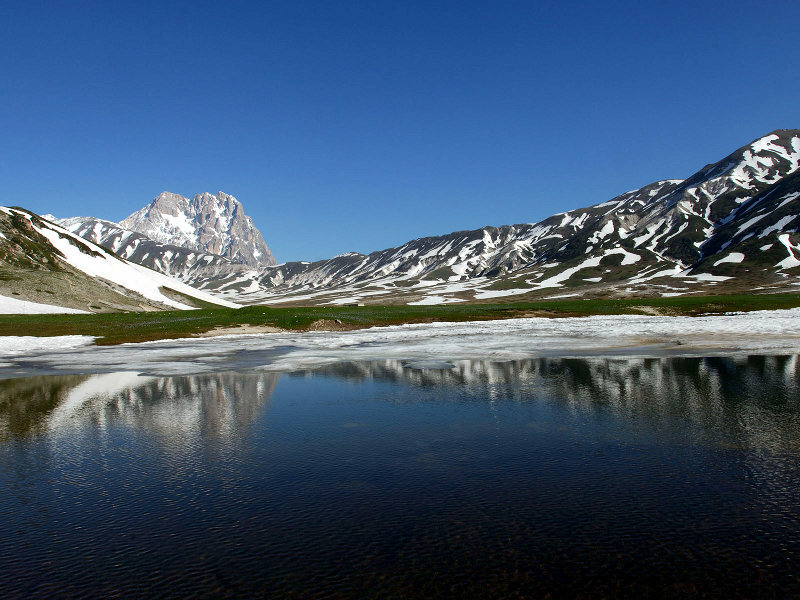 Campo Imperatore is characterised by several little lakes, some of them are perennials, but many others have only a seasonal existence associated to the snow melting. 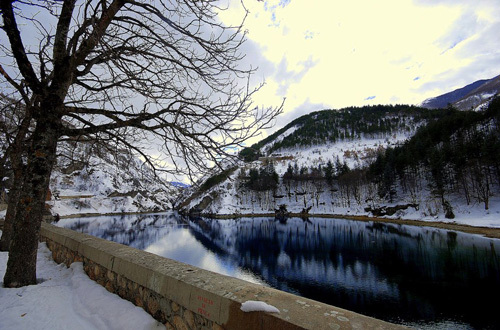 Some of these lakes can be spotted when driving along the road to Fonte Cerreto, on the right hand side, after the crossroad for Montecristo; the most known of these lakes are Pietranzoni, Santo Stefano di Sessanio and Calascio. This is another man-made lake, 10 km long and 5 km wide. 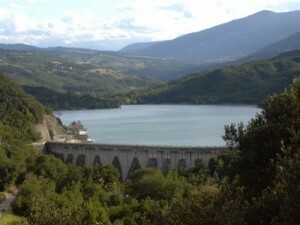 It has been created by a dam on the river Sangro (works on the dam have started on 1956 and ended in 1962). Several villages face Bomba lake: Villa Santa Maria, Pietraferrazzana, Colledimezzo, Pennadomo. The basin is surrounded by clayey slopes, and on the left side there is a chalky massif. The dam canalizes the river’s water and then transfers it to the hydroelectric central located in Altino. 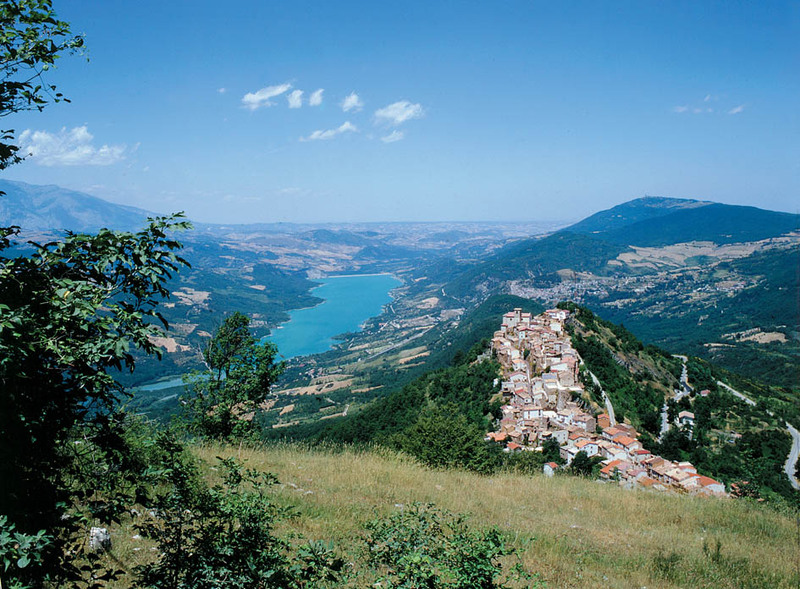 Bomba lake is a famous summer location and the stunning Majella view embellish the whole site. Beside fishing on the lake also rowing is practised, as well as rowing races. 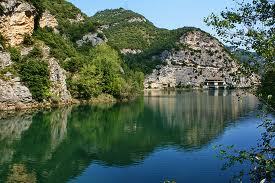 Sant’Angelo lake is also called lake of Casoli, it belongs to Casoli municipality in Chieti province. It’s an artificial basin created in 1958 by the dam of Aventino to feed the power station Acea in Selva d’Altino. 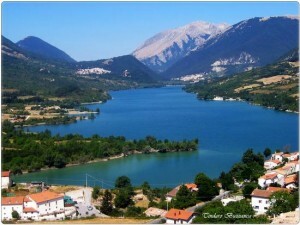 This lake is located in a suggestive, surrounded by oak trees and dominated by Prata tower, there is also a stunning view of Majella mountain. 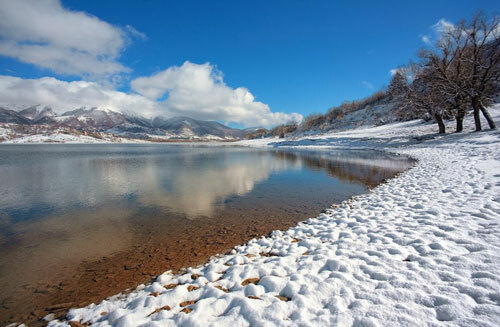 This lake is a new born, in fact it has been created in 1990, in the municipality of Casoli, Altino and Sant’Eusanio del Sangro, in the confluence of Sangro and Aventino river, creating a natural reserve of nearly 300 hectares, one of the most important in Abruzzo. Amongst the various species of plants we can find the epipactis palustris, the English oak, the Alnus glutinosa and several types of willows and cottonwoods. Close to Sant’Eusanio del Sangro has been created a centre for turtles of soft water called EMYS Abruzzo, where autochthon specimen are currently being breed. The basin of Penne was born as a result of a dam on the river Tavo. This area started to became a rest stop for migratory birds, and an area of nidification for local birds. 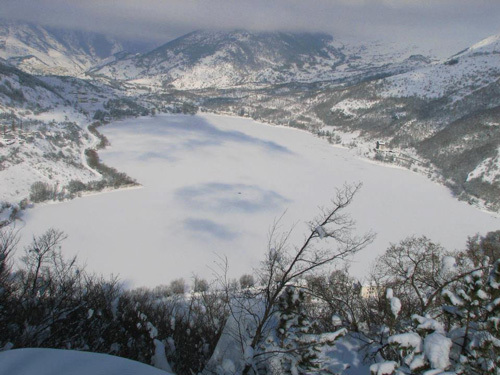 For this reason during the ’80, a group of naturist and environmentalist started a project of environmental conservation of the man-made lake of Penne, that became eventually a protected oasi and natural reserve. Nowadays the reserve offer to visitors a natural walk, a botanic garden, an area dedicated to otters and another to Mediterranean ducks, a butterfly garden, a pond for amphibious and a pond for turtles. There is also a centre for environmental education called “Antonio Bellini”. 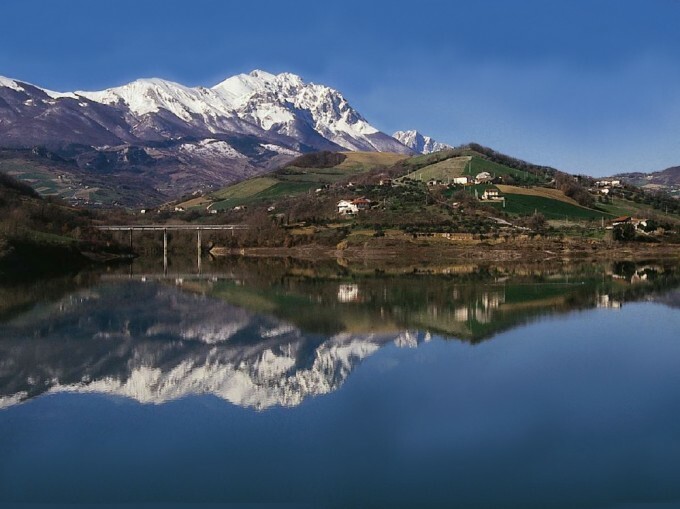 This man-made lake is located on the border between Marche and Abruzzo, amongst the Sibillini and Laga mountain, surrounded by a spectacular landscape. Its waters are clear and inhabited by numerous fishes, especially Cyprinid of big size, carps, scardinius and coarse fishes. 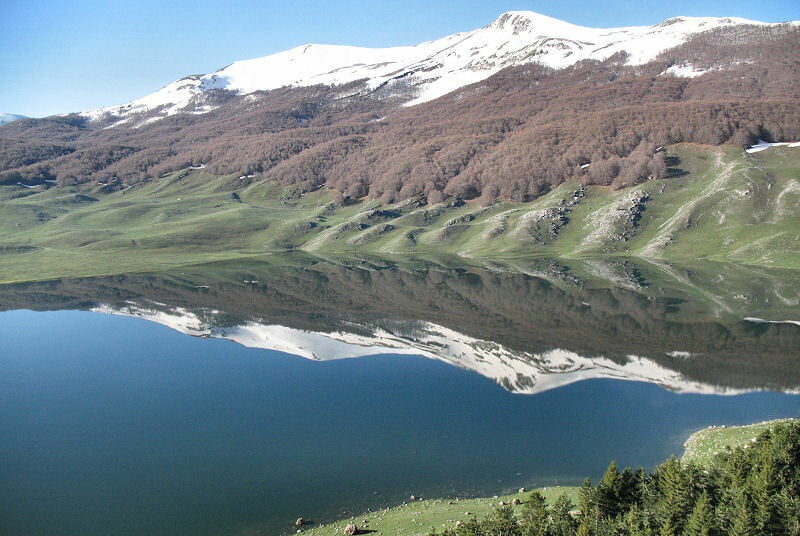 The first of August the lake is almost inaccessible because there is an important fishing race called Trofeo della Quintana linked to the folkloristic festival of Ascoli. 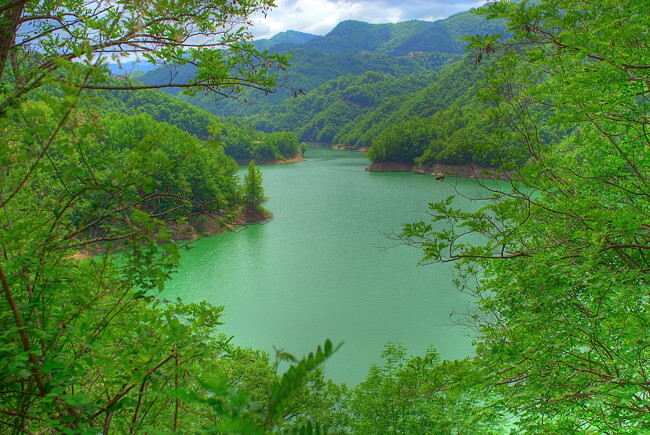 Piaganini is a man-made lake 400m long, 25m large and 20m deep. It’s totally inaccessible for any kind of touristic activity, but it represents a good place for game fishing. Its left bank is favourable for fishing while the right bank is inaccessible because of an over groove of thick wood that reaches the banks. The lake bottom is muddy with foliage, that, when the level of the lake is low, came back on the surface in big clumps all stuck together.